Put the potatoes, garlic, bay leaf and peppercorns in a large saucepan and add cold water to cover by about an inch. Season the water generously with salt. Bring to a boil, lower the heat and simmer until potatoes are fork tender. 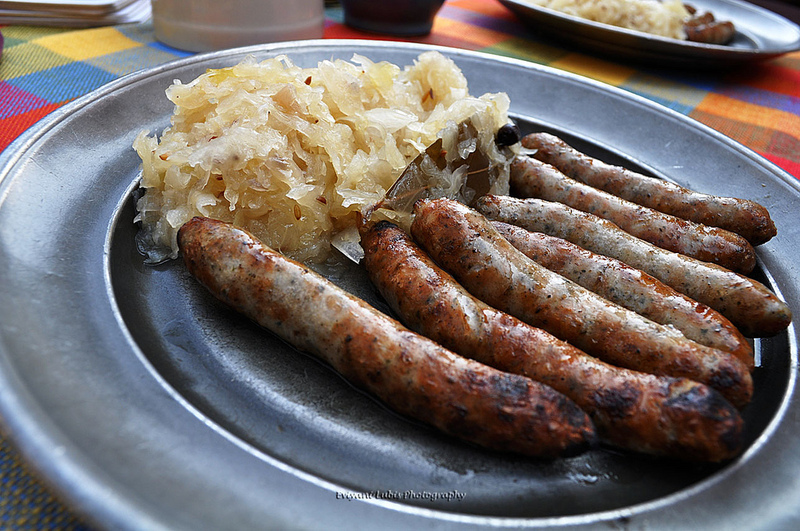 (Meanwhile get your bratwurst cooking as per below). Drain and discard the garlic, bay leaf and peppercorns. Halve the potatoes, toss with butter and season with salt and pepper. Keep warm. In a cast iron skillet or sauté pan, heat up some olive oil and sauté the onions til soft. Add the bratwurst and. after a few minutes, add the apple to the pan. Season with a little salt and pepper to taste, remembering that sausage is pretty salty as is. Add the sauerkraut and the water or white wine. Simmer under a closed lid for 5 – 8 minutes.Serve bratwurst with onions, apples and sauerkraut and drizzle some mustard on the top or serve on the side with the potatoes.